Fantastic news, but a bit concerned because it sounds like you have been disturbing them again. Barb I thought I was doing good on this one! Thursday I went to the hive to check on the feeders and discovered one was empty and the second was down to 1/4 full! They were certainly busy bees during the week, and drank over 500mL in 4 days. It was a cool overcast day and the bees that were below the feeders were not happy with me, and a few of them flew directly in to my face. Not sure if those would have been stings but they all soon retreated to the rest of the colony and what I assume a much warmer place. I definitely did not expose the colony, just observed. I didn't see any pollen entering the hive. I decided that I would wait at least until the weekend to do anything more, since we were expecting nice weather. Today was a perfect day to see how they were doing. It was 22 degrees, humid and sunny with a humidex temperature of 25! Finally the cold snap is over. I was under the impression it is still a good idea to check on the colony if weather is permitting, so that's what I did today. I thought that since it was relatively warm it would be a minimal disturbance to the bees. If I'm wrong please tell me! 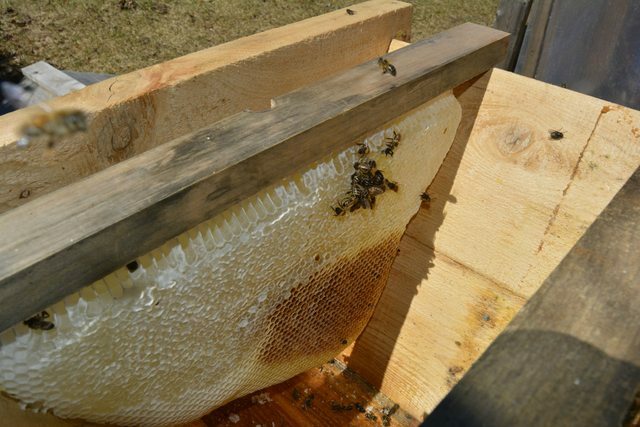 In Ontario we have to register hives and comb must be inspect-able, meaning cross-comb building can't happen to facilitate inspectors. Movable comb is mandatory so I thought it would be a good idea to check today while the weather was warm. I don't expect any inspectors, but thought it wouldn't hurt make sure the comb is being built properly. I also wanted to know if 4 bars were enough for the activity going on. I don't exactly know how many bars I should give them, and what would be the signs to look for to expand the cavity. So today I saw all great stuff. I first observed the entrance and it wasn't long before I saw workers bringing in pollen! About 1 in 15 carried pollen, sometimes they came back in bunches, sometimes no pollen for a while. Not the most bees I've seen coming and going at once, but fairly steady. Next I checked the feeders, both empty! The colony consumed 1L of syrup in 2 days or less! I'm not entirely surprised the consumption went up, it was bitterly cold the last 2 days and they probably didn't forage much nectar. Good thing they had the feeder! Tomorrow I will make a new feeding platform to accommodate two 1L jars. Any suggestions on feeding would be welcomed, I'm still in the market for a conventional feeder that can be fitted to the top of the bars. Now on to the colony..I slid the follower back to see if they had done any building at all on the 4 bars I gave them. The first bar (closest to the follower) had comb built about 3/4 of the way down in to the hive. 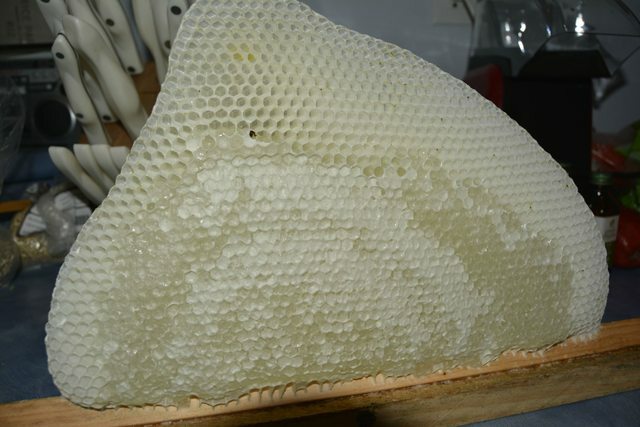 I didn't disturb the workers to see what was in the comb, but I did notice several unfilled cells. I gently moved the next bar off the group of bars a few inches and saw that the bees were forming a chain between the comb, but that there was no cross comb. 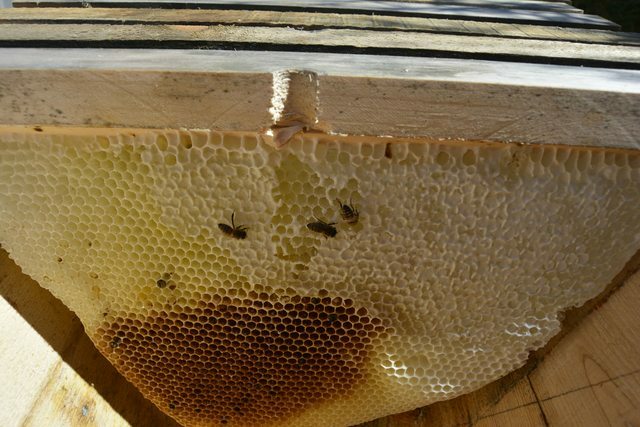 The remaining 3 bars had comb almost reaching the bottom of the hive. About 1-2" of clearance from the bottom. All 4 bars had the comb over to one side of the bar, and none of them covered the entire width of the bar. 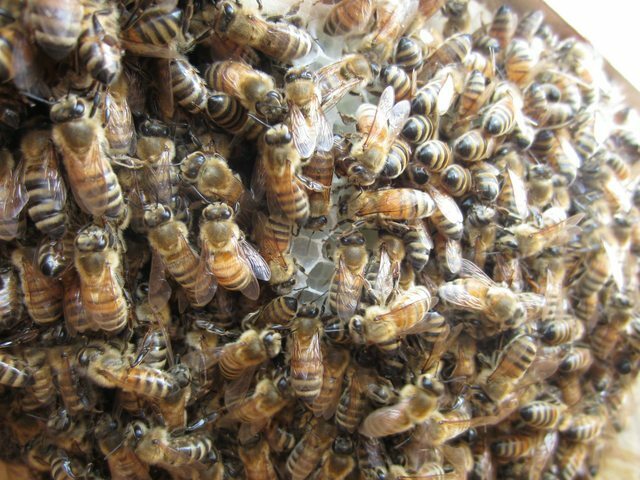 I saw many drones, but didn't keep the hive open or look long enough to try to spot the queen. I did see some workers with pollen walking on the comb, but didn't move any bees to see if there were brood cells. I noticed on the second bar there were capped cells of honey near the top. 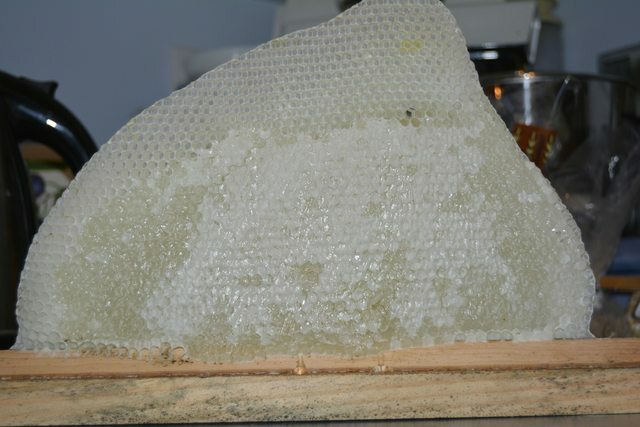 All of the cells I could see on the other bars of comb also looked like capped honey. It seemed to me a lot of bees were idle in the hive, or perhaps were simply keeping the rest warm being clumped together. When I slide the bars apart a large clump of bees fell together that were suspended in the middle of two bars. There were also many bees on the colony side of the follower. They didn't seem to be building, just sitting on the follower board. An up close picture shows a lot of them with their mouths on the wood, any ideas what they were doing? I carefully slid the bars back together, added 2 new bars expanding the cavity to 6 bars, and installed the feeder with another 750mL of syrup. I observed the entrance again before leaving and saw 8 girls fanning the entrance, where before I disturbed them there were none. I'm guessing this is because a lot of bees left the hive while I was checking things out. 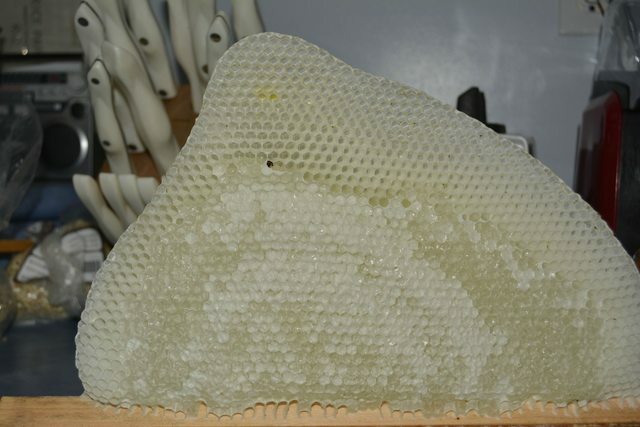 It looks to me that they are busy building comb, and filling the cells with honey. -How much syrup do they consume on a daily basis when overwintering? -Will they fill up most of the width of a bar, or will they continue on to a new bar and continue to build skinnier comb? -Based on the comb that has been built in 6 or less days, should I provide more empty bars, and if so how many more and with what frequency should I add more? 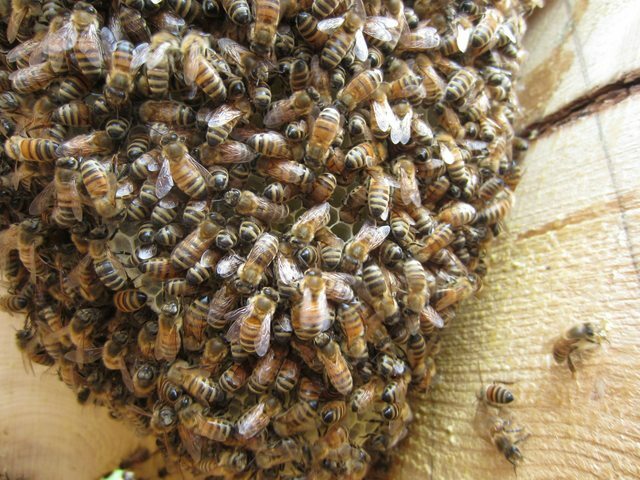 -Is it acceptable or necessary to inspect the hive at all until spring? If so under what conditions should I inspect? -How will I know how many bars the colony will need if I should keep them sealed from here on out? 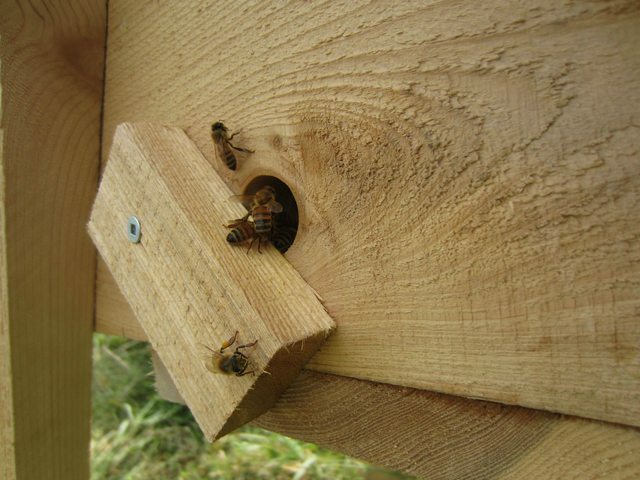 -What is the balance between adding additional bars and expanding the hive cavity, and keeping it sealed tight and leaving it alone? Thanks very much for continuing to follow my experiences, and helping me with my newbee questions. Any advise or observations you can make will help me greatly! Firstly, I can't emphasise to you enough how little chance these bees have of surviving because they have so little time left. Every time you open the hive and let the heat and nest scent out, you set them back a bit further. I appreciate your concerns about complying with local legislation but unless you leave these bees to get on and build their home and stock it for winter, they will die out and therefore not need to comply with legislation. Springtime is the best time for dealing with cross comb. By then, it has had a few generations of brood in it which stabilises it and also most of the stores will have been consumed, so it is less heavy and messy to handle. That new comb is very fragile and any attempts to correct it would lead to collapse. These bees cannot afford to lose any of the comb they have built or the contents of it, which would almost certainly have happened if you had tried to correct cross comb at this early stage. Therefore your inspection unfortunately served no purpose other than to reassure you, at a detriment to the bees. I do understand how tempting it is, really I do, but PLEASE, PLEASE resist. If you are worried about something like that again, we are here to offer advice. 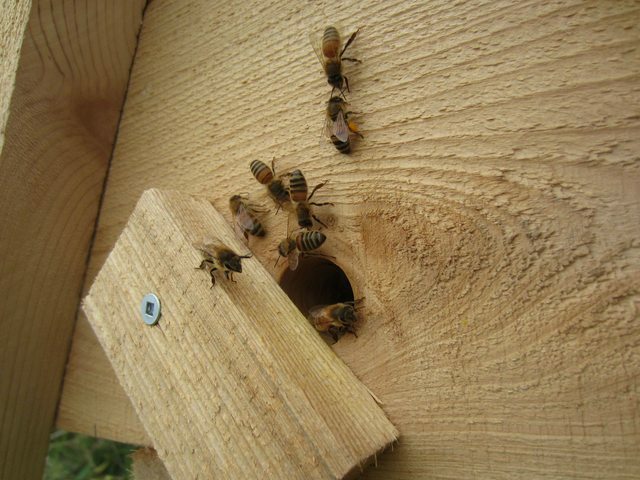 Anyway, moving on, the fact that they have built comb and pollen is going in is a very positive sign and suggests they are queen right. Huge relief! Yes this is within the normal range. How much syrup do they consume on a daily basis when overwintering? Your bees have Italian blood (they have tan banding on their abdomen) and will therefore consume more and your winters are probably longer and colder, so they will need more. I would say probably 20-25lbs for a colony that size. What you can do, if they don't manage to store that much is to drill one or two holes in a top bar and place a slab of fondant in a plastic bag with a hole in the underside of the bag to correspond with the hole in the top bars, with insulation on top of the fondant. Keeping them compact will encourage them to build along the whole length of the top bars. It also means they have less empty void within their chamber. 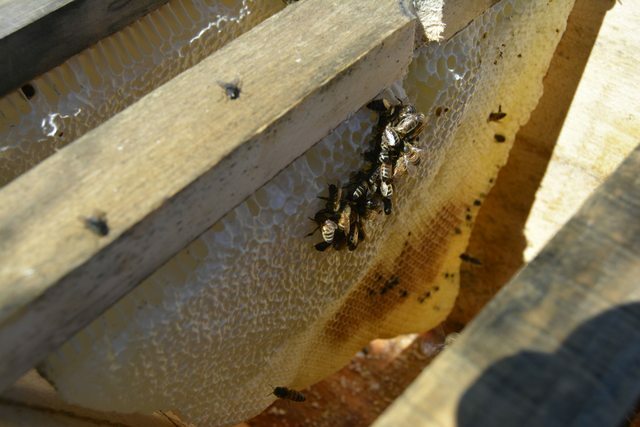 Wall to wall comb will retain heat better, so ideally, you want them to fill the width of the hive out rather than building comb on more and more bars. I would probably only have given them 1 extra bar, but now they have 2, I would just leave it for now. If you look at those photos, they have enough room to easily build as much comb again, just on those 4 bars, so they have plenty of room. Once the temperature drops, they will find it more and more difficult to build comb and construction will slow down and stop. This is why time is so short for them. Then they need to completely fill it with syrup and honey. It depends how you define inspect? Moving the follower board back and having a quick check is one thing, moving bars and disturbing the cluster is another altogether. 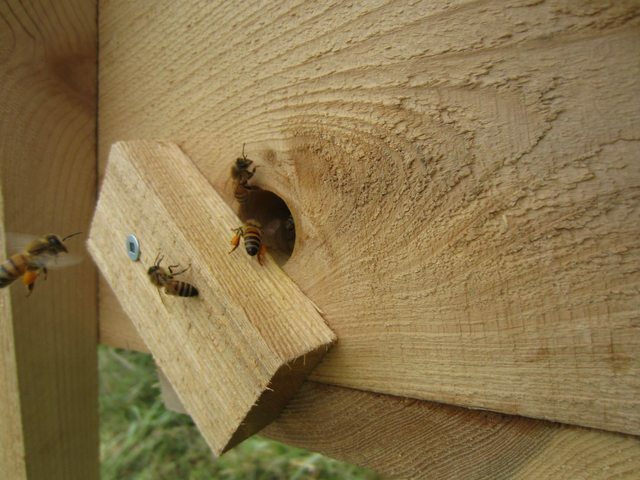 It is one of the beauties of horizontal top bar hives, that you can have a peek in the end without intruding too much on the bees. I would check in a couple of weeks on the finest day you can and see how much more comb they have built (a check is just moving the follower back and looking in) and remove any empty bars. The only purpose of this is to reduce the amount of empty space in the cavity as it will help them to keep warm. After that I would only have another peek before spring if it was a mild (10+Celcius) sunny day mid winter and they were not flying. (they need to leave the hive to have a cleansing flight (poop) every couple of weeks ish) so a lack of activity at midday on such a day would suggest there is something wrong and perhaps they are starving or have died. Either way, nothing to lose in checking. That is a difficult one to answer and it is pretty much a question of experience. Unfortunately with this colony being so late, it is not something that they can afford you to cut your teeth on. I would be extremely happy if they manage to build 5 reasonably full combs...... 6 would be a huge bonus. I would not even offer them more than that. If this was springtime or early summer, that would be another matter and you would keep adding until they stopped. Usually, they produce 10 or so and then raise brood in them and then, when that brood hatches and matures, they start to build again. Most people would consider that an August swarm had little hope, so you can't expect miracles from your Sept girls. They are doing really well at the moment and should be able to over winter in that hive on 5 decent sized combs if they have plenty of insulation, but it is better for them to consolidate what they have rather than over stretch themselves in my opinion. If the weather stays warm, I would stick with 1:1 syrup for another week and then switch to 2:1. If you followed your friend's advice and switched to 2:1 when he told you, I would just stick with it. For your information, they are probably capable of taking a litre of syrup a day, so don't be so surprised at consumption. They might be small but they can certainly knock it back and as you are seeing, they are storing the excess in the comb already. Don't want to disillusion you but the capped "honey" you saw may well actually be capped syrup. Hope I have covered all your concerns and you have some better understanding of why we are so concerned about you opening up this hive.... ordinarily, at the appropriate time of year, it is not such a problem although as you gain experience, you realise that it is not necessary and not beneficial. These bees are in a uniquely vulnerable situation and really can't afford the disruption. For information, I now hive my swarms when they emerge in May June and July and don't disturb them AT ALL until the following Spring. They survive much better without my interference. 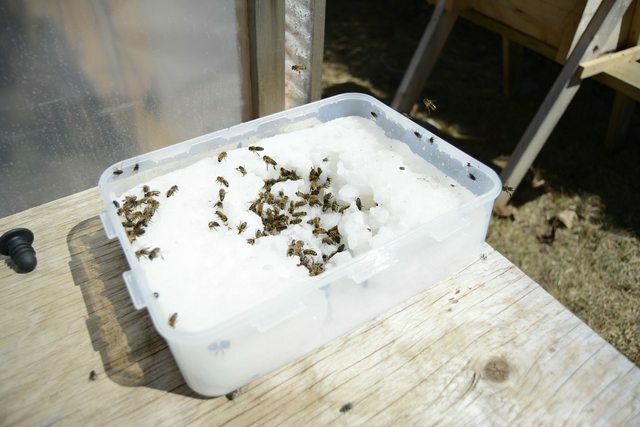 Having windows in hives helps particularly if you are inexperienced and that might be something you want to consider for next time. If the bee inspector comes then obviously we would inspect them IF he felt it was necessary and if there was some cross comb then it would have to be dealt with there and then, but I can assure you it is infinitely easier and less stressful to you and the bees to correct it the following spring. Best wishes to you and your bees. PS. The bees on the follower board may be propolising it. Thank you very much Barbara, that answers all my questions and helps me a lot. I'm still filling 1:1, I'll switch to 2:1 after the next week or so. We have a good 7 days of above 20 degree sunny weather ahead, followed by more seasonal cloudy and cooler days afterwards. I'll pick myself up some big 1.9L mason jars so I'm able to fill 3.8L each visit. I will absolutely, positively, not move any bars or disturb the bees from now on! Like you said, only a quick peek behind the follower, and only on a warm day sometime before winter sets in. So I suppose the race is on, the bees must build enough comb to store enough food to survive the winter. I'll keep them warm, keep the feeder topped up, and hope for the best! I'll do some looking in to making fondant as well. 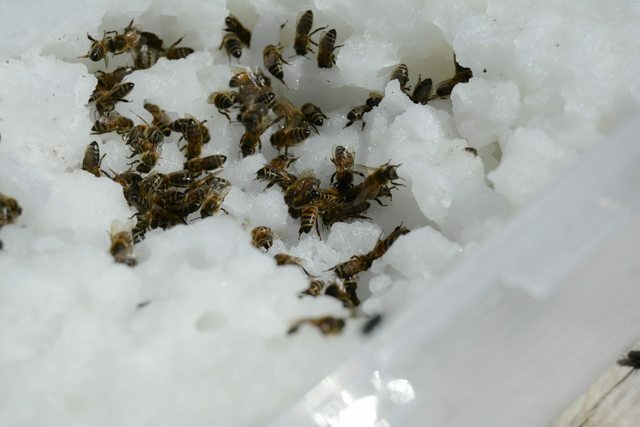 There is a conventional rule about moving hives less than 3 feet or more than 3 miles. 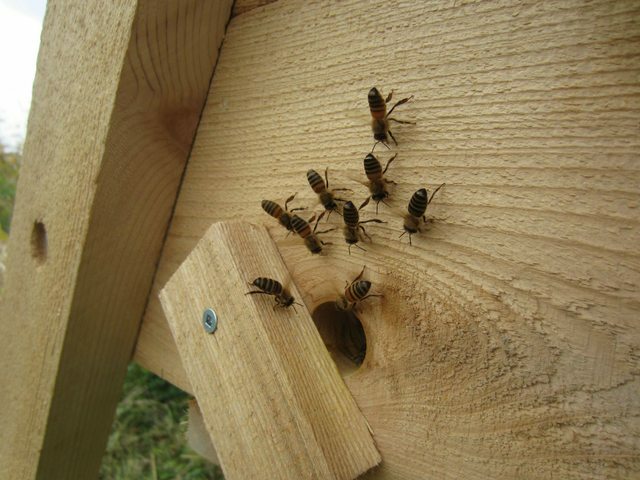 Bees orientate to the hive's location once they move in. 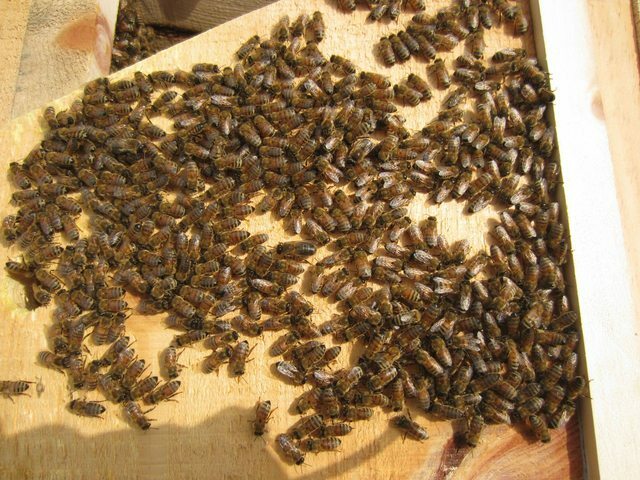 Moving the hive without following that rule or taking certain precautions will cause you to lose bees you can ill afford. 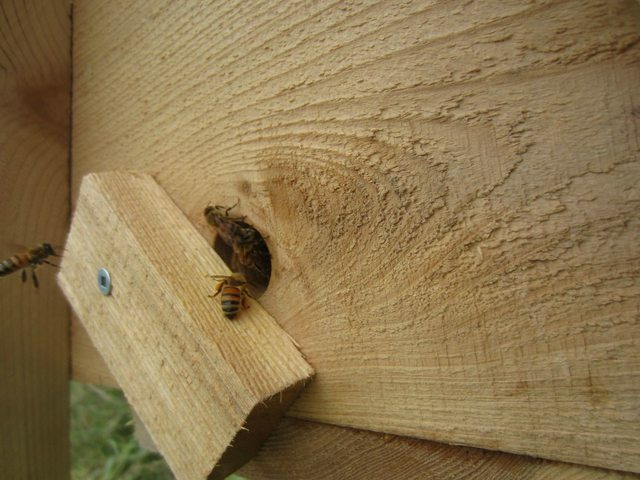 If you are going to move the hive more than 3 feet and less than 3 miles, you need to do it on an evening when all the bees are at home and temporarily obstruct the entrance, so that when the bees get out the following day, they realise that something has changed and they need to re orientate to the new location. A twist of dry grass loosely stuffed in the entrance and/or a branch with foliage across the front works well. I know in colder climates, beekeepers sometimes move their hives into sheds, with a tube to the outside. I have no experience of this practice but in very windy artic type winter conditions I can see how it would be beneficial. If you get mostly snow but not the arctic blasts then the hive should be fine outside sheltered from prevailing winds and as you suggest, the snow can actually act as insulation in itself. Just wanted you to be wary of moving the hive repeatedly and unnecessarily as you don't seem to be aware that it can cause the bees problems. Where it stands now it's very unprotected and was only a temporary move to get the bees away from the neighbors house. I was planning to wait until most of the foraging is over and the hive activity slows down to move them again. I'll wait until nightfall and seal them all up and take them to a final overwintering place that is protected from winds. We do get arctic winds and we are up on a hill so protection from wind will be crucial. If there is a Bee specific God, surely I have his favor! The last several weeks have been excellent. We've had very warm weather, and even to this day we still have flowers in bloom. The colony really kicked up it's syrup consumption, to almost 2L a day! I made a new feeding station that would fit 1L jars and found myself almost filling them both daily. After about 2 weeks the consumption slowed down a bit, when we had out warmest weather. I hypothesize they completed most of the comb construction in that time and didn't need so much energy. I haven't seen any drones in the last 3-4 weeks, and I still see pollen coming in to the hive. Also experienced my first attempted sting. When I was loosening a stick jar lid, a bee got in behind my hand and I squished her when I gripped the jar. She stung my glove but the stinger barely made it through the leather. Stringers are longer than I imagined! About 10 days ago the weather turned cold again so I finally made the switch to 2:1 syrup. I had been using 1 jar 1:1 and 1 jar 2:1 for about a week and noticed they were taking mostly 2:1. The consumption of 2:1 was at first very high, but has not tapered down to about 2L every 4 days. Our day time temperature is still reaching the 20's, so I couldn't be happier! Lots of activity, lots of Bees, lost of syrup being stored and consumed, and I like to imagine lots of Bee larva growing happily. I had made a mistake when I last had disturbed them and actually left them 7 bars and not 6. Yesterday was a 20+degree day and very high humidity so I finally allowed myself a look. I leaned the follower back only a crack and saw that the 7th bar was almost the full width of the bar, and had capped comb all through it. The only other observation I made was through the end entrance hole, and saw that comb was all the way down to the floor, partially covering the hole on the inside. I did notice the Bees were a bit more aggressive during the feedings when they were taking the highest amounts. Not trying to sting me per say, but their behavior felt more aggressive to me. I've come up with an easy way to give them access to sealed fondant. Does anyone have a go-to recipe they use for fondant. How much should I give them, and when should I give it to them? Also a question about moving them for the winter. I know moving isn't ideal, and as of now my plan is to leave the hive alone until all foraging stops, and fall comes to an end. Then I'll move the hive to a protected area before the hard cold and winds set in. Will the hive activity go sharply down once all forage is spent? 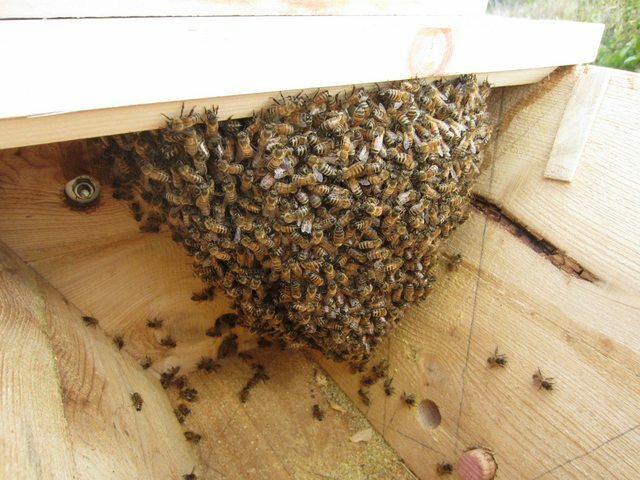 What's the best timing to move the hive that will ensure it's not going to greatly disturb them? Thanks for keeping up, and thanks again for any help. What's the best timing to move the hive that will ensure it's not going to greatly disturb them? Great to get this update ! I was wondering what had happened to you and your bees. Yes, just move them when they have stopped flying. A cold and possibly rainy day is quite good. Try and choose a day when the day after will also be cold and rainy. The idea is that there are no foragers out flying who will come back to the wrong place. If you weren't moving precisely because of the cold and wind, I would do it in the coldest part of the winter, although probably your winters are colder than mine and that might not actually be practical for you. When you're moving them less than 3 miles / 5 km in the warmer months then you can loosely stuff grass in the entrance. Once the bees have spent effort and time clearing the entrance, they will do re-orientation flights and not try to fly back to their old home. And sometimes people will put another hive where their old home was to collect the confused returnees. But in the winter any flight will of necessity be a very short flight and none of this is necessary. Just a quick reply ( glad to see them doing well ). I would be a big concerned about putting them in a greenhouse, for exactly the reason you describe. 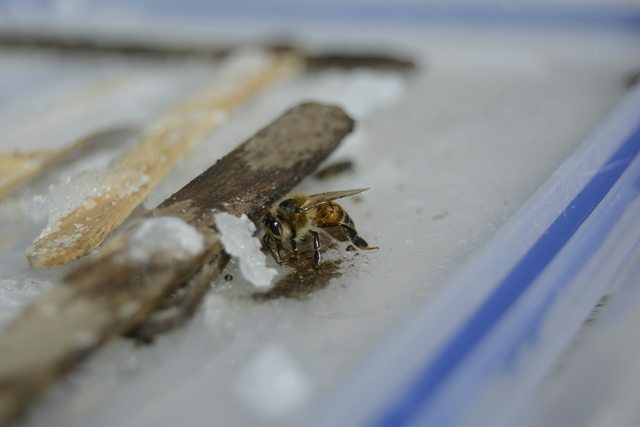 If the temperature gets too high, the bees break the winter cluster and start flying, but if it's freezing outside all this does is use up stores for no benefit. Tomorrow I will move them outside and keep them outside until we hit hard winter. We are having rediculous fluctuations in temperatures. -15 last week, +15 this week. I'll move them in once winter actually hits, and I'll make them a tube entrance that leads directly outside so when they do go for winter flight they won't be trapped. The greenhouse is only about 2c warmer during the day when we have full sun so hopefully that'll be alright and help them not hinder them! Perhaps I would be better suited to build a hay bale shelter outside and leave them outside? Hay bales, extra insulation, wind protection, all that seems like a good idea to me. If there's a lot of snow about, make sure the entrance is always kept open. I don't think I would ever put a hive in a green house. I'm not sure I believe that the temperature difference in full sun, even in winter, is really only 2C. People in Central Europe do overwinter hives in their cellars, but they are dark and more or less constant temperature, almost the opposite of putting them in a greenhouse. We are having a rough one. Ontario has been hit with cold arctic winds again and again. I've lost count of how many days we've experienced -25c and below! I installed a sealed container full of fondant over the top bars before winter set in. A small tube feeds down between two bars to where I hope they are now clustered and happily eating. When I drilled the hole they were between other comb, so I'm hoping they found it! I infused the today with safe essential oil to help them find it. I insulated with 1.5" foam insulation on the sides of the container, and set a pillowcase of straw on top. I secured the roof down tight to try to eliminate any gaps. I moved the hive to the side of the greenhouse, and set up a wind block so it is protected from 3 sides completely. We've had a lot of blowing snow so some has been entering the entrance hole regardless of my best efforts. I've kept the entrance clear enough for bees to leave. Some good news as well! 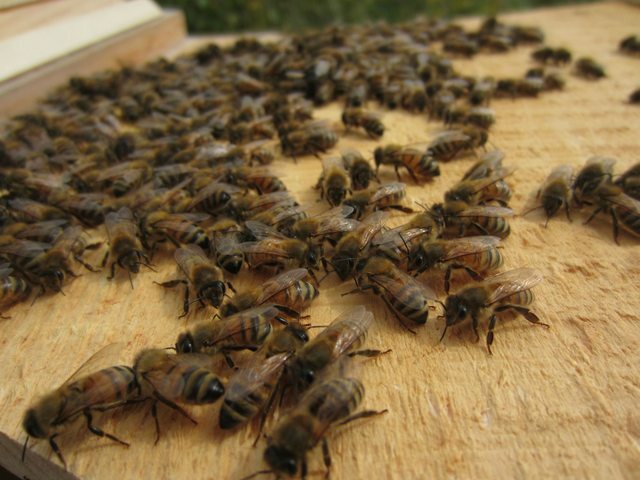 Early in winter the bees kept busy removing dead workers, ejecting them from the hive and keeping things clean. I was a bit alarmed to see how many there were outside the hive, but I understand all the summer workers die off. In the last 2 months I haven't seen any bees fully ejected from the hive, but clustered on the floor near the entrance. I'm guessing just too cold to exit completely. The best news of all, they are all still alive inside! I've been placing my ear on the outside of the walls and can hear the low humm and buzzz of the colony! So far they have survived a September swarm, and bitter cold in the -20s for months. I don't know if they are eating fondant, but if not then have plenty to eat in spring! Sounds rough - I hope you and they make it through to spring! In those conditions, I think it's pretty amazing that they're still alive at all ! You have been doing a really good job so far. Well the verdict is in, our coldest winter on record did not do these Bees any favours, and alas they have all died. I hadn't seen any activity in late March once we finally hit a few days above 0, and couldn't hear anything going on inside either. Today we had an excellent spring day, I think a high of 18! I was planning to open up the hive today to clean things out, and I was ushered along by none other than honeybees from the feral tree hive! Seeing them buzzing around searching for early blooms confirmed to me for certain that I would meet no living bees in my hive. I'm sure it's the same for everyone, their first lost hive. I would say that they died due to the extreme cold. I don't believe it was a case of being too cold to make it to food and thus starving with food all around, as a large number of bees were dead inside the honeycomb. I can only assume that most of them flash froze together. 100's of bees frozen mid stride, half inside comb, fully inside comb, a few small clusters here, a few large ones there. Most of the colony was split 3 ways between the first 3 bars, judging by the density of bees stuck on the comb. 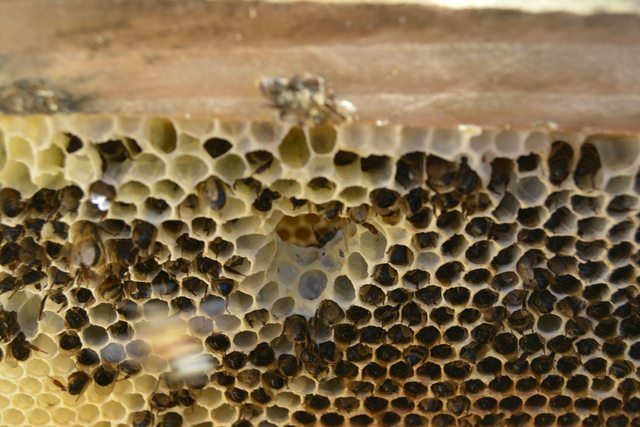 They had even made openings to connect the gaps between comb, like tunnels. Most of course had dropped to the floor. I didn't take any pictures of the deceased, but I did check them out to see if mites or disease had played a part. They all appeared to be completely healthy and strong. There are almost 3 full bars worth of "honey" left at the back of the hive. Also to my surprise they had built comb on the floor! Perhaps it had broken off in the fall and they built around it and repaired the comb above, as I can see no damage to the comb above. The hive has a pretty musty smell to it, there was some mold growing, which isn't a surprise to me with that big of a clump of dead bees laying together. On the plus side, those bees that greeted me around the gardens this morning confirms that the feral tree hive had no trouble surviving the worst winter on record here in Ontario. I walked over to verify, yep, coming and going just as if it were summer! It didn't take them long to discover the open hive once I started inspecting, and before long they had returned in numbers to take their fill! It is a great consolation to see that the very same bees that swarmed in the fall were now taking advantage of the work of the exiled hive mates. A bit ironic, and perhaps this was their plan all along?! They came in the hundreds to take advantage of the still capped "honey" and I was filled with great pleasure to be surrounded by the very same bees! Several of them hovered in front of me as if to say thanks. Lucky for them I also had my entire container of fondant untouched(the bees in my hive never made it back to the 4-5th bars, which is where I drilled the hole down for them), so I opened it up and they gobbled that up as well. My hope is that because there are no nectar sources yet here, they'll have an extra boost this spring by my helping them. It really is nice to see all the hard work my bees did going to good use. Should I let the feral Bees eat the fondant and the comb? I've considered that perhaps it might harm the other bees if there was disease in my hive, and also that the fake honey may weaken them. What are the opinions on this? We are some time before any local blooms, so I suspect that the number of honeybees I saw flying today may be a result of the warm weather alone? I'd like to purify the wax to make a candle, and I've found a few people using cheese cloth and boiling the wax to purify. Can anyone make recommendations on how to make use of my beautiful white comb? I've removed as many bees as I could but there are still many many stuck completely inside cells that I also need to remove. Perhaps tweezers? One more thing to add, I watched the bees frenzy for some time and noticed that they were coming from 3 distinct directions, all very different than the other. I think it's possible there is at least one other feral hive nearby. If so, how rare and strong are the genetics of these bees?? I've already heard that a local beekeeper that uses langstroth hives(no treatments) has suffered over 75% losses. This is the last bar in the back of the hive, also the smallest comb built. Only one single bee died back there in a cell. Thanks, and more pics coming tomorrow! A pity, but you did everything you could, and gained some experience with bees. It was always going to be difficult with a swarm as late as that in such cold weather. The survival of the colony in the tree does show that it's possible for bees to survive in your conditions, so that should give you some hope. Have you considered just leaving the hive intact with all the combs in it ? The bees in the tree know where the hive is and might well swarm directly into it. It will smell just right and the combs will make it even more attractive. Thanks Adam, yeah I was hopeful and perhaps they would have made it had the winter not been so brutal. I would absolutely leave the hive intact and take it over to where the feral colony lives, but alas I'm moving from Ontario to BC in a few days! I found out today that one of my homesteader friends found a feral colony in a tree last year when cutting down a fallen tree. 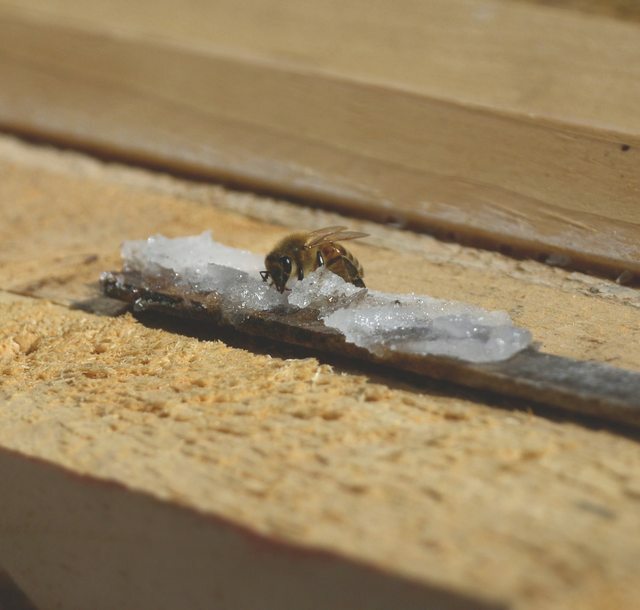 His bees were fighting against the odds as well because the colony was about 25 feet high originally, and it had to overwinter near ground level all winter. I've decided to donate my top bar hive to him so he can set it up as a bait hive close to the feral colony. I had already brought inside the most pristine top bar/comb that was at the back of my hive, originally to proudly display to the family, and now it will come with us to my friends farm to set up in my(his!) hive. It is still mostly capped cells so his colony should quickly find it and chow down! Today the bees are coming in huge numbers to the fondant and my hive. I took lots of pictures from the outside, tonight I'll bring in all the comb and take some inside pictures to share with you folks how much these guys built before winter struck, personally I'm impressed with how much they built, what do you guys think? Thanks for the tip Dexter, I'll give it a try! I have 5 bars to melt after the 2 I've set aside to save. Internet problems, having trouble with uploads at the moment, stay tuned for more pics later! I've successfully donated my hive, and managed to transport a bar with comb safely to his farm. His feral colony looks great, lots of activity, so hopefully they'll take the bait and swarm to his new hive!